Star Wars: Age of Republic - Count Dooku #1 continues the trend of outstanding one-shots that have been coming out of this anthology recently. It tracks Dooku on an undercover mission to Sullust that becomes complicated when a Jedi Knight appears nearby. One of the few stories to avoid the “conflicted hero” theme, Dooku #1 gives us a villain who is already fully given himself to his cause and has no great struggle with the actions he must take to ensure the rise of the Sith. The Count is written exceptionally well; any of the lines in his inner monologues could have been delivered easily by Christopher Lee. This story may lack the central purpose of some of the more thematic issues in Age of Republic, but it's a quick, well-crafted espionage thriller that makes good use of every panel and page. 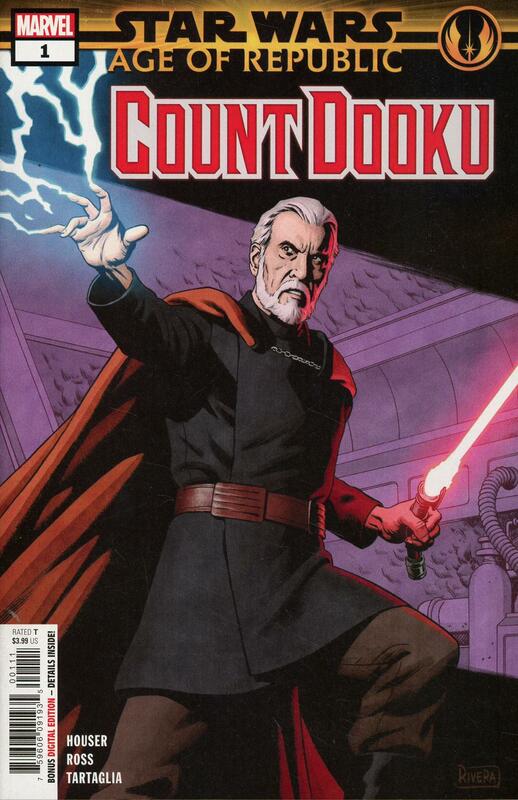 Count Dooku #1 is another fantastic one-shot in what has quickly become my favorite Star Wars series running. It’s a little out of step with the other Sith and Jedi stories in Age of Republic and loses the theme, but it offers a glimpse of the Count as an agent of the Emperor — happy to highlight his deftness in diplomacy and double-crossing as much as his skill with a lightsaber.